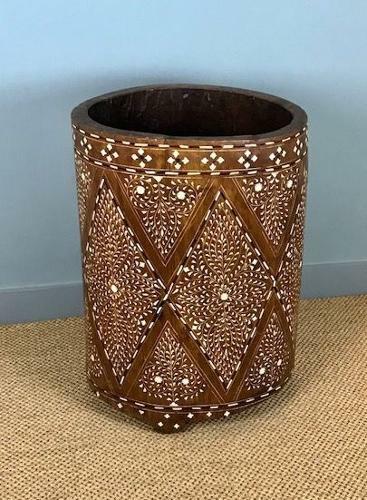 A large and particularly decorative, Anglo-Indian 'Dug out' planter of oval form raised on three integral feet. The body of the piece is profusely inlaid with geometic patterns and foliate motifs in bone and ebony typical of the work found in Hoshiarpur, India. Ideal for use as a jardiniere, for sticks and umbrellas, magazines or children's toys. Circa 1910.